We receive precious letters from our students. In these letters some testify to their salvation and others at how their lives had been changed by God through these Bible correspondence courses. I am pleased to share some of these letters with you. My prayer is that it will encourage you to glorify God. This is His work. Someone else writes:: “I was a lost son, but this Good News Mailbox have changed my life. Now I know that God loves me. Now I trust that my life will bring glory to Him.”.
" I am a long term inmate in Windhoek Central Prison. I was sentenced to life imprisonment on 08 June 1989 for murderX2. 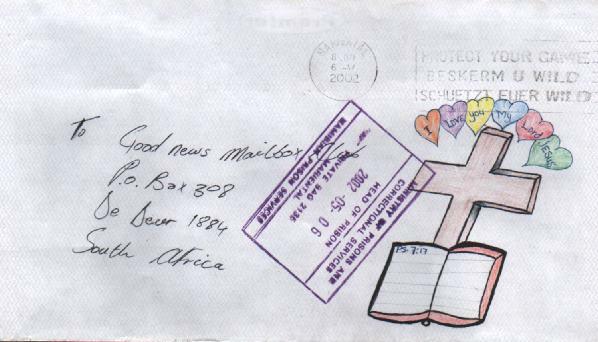 I am very much interested in your Bible course…"
Boksburg prison: God bless you and the staff, they are doing a marvelous job, I have learned many things through the Bible course. ZAMBIA:...receiving this course free, is like receiving wisdom and knowledge on a silver plate. SWAZILAND: I was so happy to receive a course unexpected. I believe someone who loves me enrolled me. To be honest, your book really helped me a lot. I have learned a lot. Namibia: I need too much that Bible Studies… I am one of the many prisoners in this country who truly regrets breaking the law. I cannot forgive myself for my sins. So I turned to the Lord to help me heal myself.